Holloween Music, History and Celtic Day of the Dead. "Trick or Treat,* smell* my feet, give me something good to eat." Starting with The Original 'Nightmare' Was a Demon That Sat on Your Chest and Suffocated You Maere, mara, mahr, mahrt, mårt---by any name, it was and still is a terrifying visitor. The root of the English word "nightmare" is the Old English maere. In Anglo-Saxon and Old Norse, a mara was something known to sneak into people's rooms at night, plop down on their bodies, and give them bad dreams. When the mare came to visit, the victim would feel a heavy weight --- it might start at the feet, but it always settled on the chest --- and lose the ability to move. Mares could be sent by sorceresses and witches. This apparition roamed across Europe according to (now retired) folklore scholar D.L. Ashliman. Ashliman collected accounts of mares from across Europe, as well as advice for how to get rid of them. People troubled by mares might want to place their shoes by the side of the bed and turn the laces towards the place where they plan to lie down. Mares snuck in through keyholes or knot holes, so plugging these openings could keep them away. Alternatively, you could enlist a friend, wait for the mare to appear, and then plug the hole to capture it. Nightmares was a way to explain a type of sleep paralysis that, as historian Owen Davies writes in Folklore, Viewing page  of pages 181-203 affects perhaps 5 to 20 percent of people in their lifetime. Sleep paralysis happens at the edge of sleep, usually just before sleeping or just after waking. Sufferers can see and hear, without being able to move or speak. And some people who experience this state also report feeling a heavy pressure on their chests and a sensation of choking, and the sensation of a dark presence in the room. Abstract Witch-trial records, and other early-modern writings on witchcraft, reveal that in various European societies people complained of being physically oppressed at night by witches and other supernatural beings, the victims of these nocturnal assaults describing a similar set of symptoms. Contemporary English authors termed the experience the "mare" or "nightmare." In the twentieth century, it has been identified as a manifestation of "sleep paralysis." Medical studies and surveys of the condition help us make better sense of the historical accounts, while an awareness of the historical evidence illuminates modern reports of sleep paralysis experiences. Halloween has its origins in the ancient . The festival of Samhain is a celebration of the eCeltic festival known as Samhain (Irish pronunciation: [saun]; from the Old Irish samain)nd of the harvest season in Gaelic culture, and is sometimes regarded as the "Celtic New Year". Traditionally, the festival was a time used by the ancient pagans to take stock of supplies and slaughter livestock for winter stores. The ancient Gaels believed that on October 31, now known as Halloween, the boundary between the alive and the deceased dissolved, and the dead become dangerous for the living by causing problems such as sickness or damaged crops. The festivals would frequently involve bonfires, into which bones of slaughtered livestock were thrown. Costumes and masks were also worn at the festivals in an attempt to mimic the evil spirits or placate them. The term Halloween is shortened from All Hallows' Even (both "even" and "eve" are abbreviations of "evening", but "Halloween" gets its "n" from "even") as it is the eve of "All Hallows' Day", which is now also known as All Saints' Day. It was a day of religious festivities in various northern European Pagan traditions, until Popes Gregory III and Gregory IV moved the old Christian feast of All Saints' Day from May 13 (which had itself been the date of a pagan holiday, the Feast of the Lemures) to November 1. In the ninth century, the Church measured the day as starting at sunset, in accordance with the Florentine calendar. Although All Saints' Day is now considered to occur one day after Halloween, the two holidays were, at that time, celebrated on the same day. Liturgically, the Church traditionally celebrated that day as the Vigil of All Saints, and, until 1970, a day of fasting as well. Like other vigils, it was celebrated on the previous day if it fell on a Sunday, although secular celebrations of the holiday remained on the 31st. The Vigil was suppressed in 1955, but was later restored in the post-Vatican II calendar. Halloween as it emerged from the Celtic festival of Samhain (summer's end), picked up elements of the Christian Hallowtide (All Saint's Day and All Soul's Day), arrived in North America as an Irish and Scottish festival, then evolved into an unofficial but large-scale holiday by the early 20th century. Irish-English bi-lingual Film about Origins of Halloween from Celtic festival of Samhain. Film traces origins of Ireland's biggest Halloween Carnival in Derry back to troubled years of 1980s. It also traces origins of Halloween itself to the Celtic festival of Samhain. Dr. Jenny Butler from the Folklore Department of University College, Cork narrates this. Film uses footage from spectacular 2013 Inferno show, produced by LUXe, based in Donegal. A bi-lingual film about the origins of Halloween won Best Short Documentary Award at the Underground Film Festival in Cork. In addition to the award, the project has learned that the film has been recommended to teachers of Religious Education in England. Ed Pawson, Chair, NATRE, National Association of Teachers of Religious Education, has described it as "an exciting resource to widen our understanding of the diversity and origins of religion, beliefs and customs today". The film traces origins of Ireland's biggest Halloween Carnival in Derry back to troubled years of 1980s. It also traces origins of Halloween itself to the Celtic festival of Samhain. Dr. Jenny Butler from the Folklore Department of University College, Cork narrates this. There was an old nursery rhyme called There Was a Lady All Skin and Bone that was printed in 1810. It also contains the line "The worms crawl'd out, the worms crawl'd in." And another nursery rhyme, which can be found in Gammer Gurton's Garland's 1810 edition, that has a similar line. It happened upon a certain day, This lady went to church to pray. When she came to the church yard, There the bells so loud she heard. When she came to the church within, The parson prayed 'gainst pride and sin. Then she unto the parson said, Shall I be so when I am dead? O yes! O yes! the parson said, You will be so when you are dead. The worms play pinochle* on your snout. Students try to determine the order of the rhythmic patterns which of course by the end is next to impossible. Discussion ensues about how the composer has made the piece interesting despite only using 3 different rhythms. Use a beanbag -- Pass On The Beat -- -- Get and use a hand drum to reinforce beat. 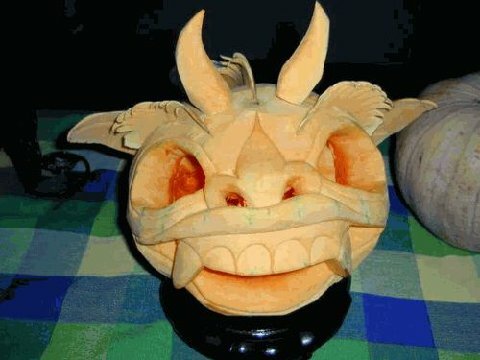 Here is one, round & fat, turn into a jack-o-lantern just like that! Whoever has the bag on "that" gets to draw eyes, ears or nose (and you can go on) on a big pumpkin that you drew on the board. The song is in d minor and I have indicated eighth rests with a "7"and B-flat as "B*"
Boom Pipes play a steady beat A D A D while singing the verse, (beginning with a four-beat introduction) until the last measure,when they play "D-A D" on ti-ti- ta. After this final "D-A D" at the conclusion of the melody, the triangle plays four steady beats to herald the arrival of the " scary tune" which lasts for a total of eight beats and is played on all other Orff instruments. Take out all the C and G bars and replace the B-naturals with B-flat bars, so that the instruments are set up with only the bars D E F - A B- flat. Use as many octaves as are available on each instrument. "1 & 2 & 3 & 4 & 5 & 6 & 7 & 8." Also, on the final note of the "scary tune" which the children play on Orff instruments, I observe a fermata before resuming the 4-beat introduction on the Bass Bars which leads into the repeat of the A-section song. This gives us a chance to enjoy those delightful eerie overtones before we resume the song. After the conclusion of the "scary tune," we again have a four beat introduction using D & A on the bass bars, and we again sing the song, giving our activity an ABA form. When we sing this version, I have the children hold their mallets above their heads like they have "antennae" while they are singing the song (a spook from outer space, perhaps?). They think this is GREAT fun and I love it because it keeps them from trying to play the "scary tune" too early while they are singing the A section song! The boom pipes keep everyone together. Add color with untuned percussion in the rests at the ends of the phrases - flexitone, vibra-slap, cabasa, whip, guiro, slide whistle, ratchet, and a couple of bony-sounding rattles. Intro: Boom pipes 8 beats: ADAD then continue through to the end of the verse ending in DAD. Teach poem. Stress beat and rhythm. On AM, have students play a half-beat on c-g. On AX or SX, have xstudents play the rhythm on any notes. There, you have improvisation. Ask the students stitting and waiting to listen to the xylo to see if it is speaking the poem with the rhythm. I also have a worksheet where they can write in the rhythm. Professor Gregory Hansen was teaching Baudelaire, and suggests there's some resonance between the children's rhyme and his symbolist poetry. Here's Charles Baudelaire's approach to a similar topic. You'd faint away upon the grass. The leading theory says that poor children in Britain and Ireland went door-to-door on Hallowmas taking food in trade for the practice of “going-a-souling,” a ritual of praying for the dead on All Saints Day. This practice actually replaced the even older tradition of people leaving food and wine outside for the roaming spirits. While that may be the start of it, that didn't happen in America, where trick-or-treating may have simply started with children trading songs for treats in the 1910s, according to old newspaper texts. The tradition didn't really spark until after World War II when popular children's magazines started discussing it and the idea entered pop culture, including radio shows and cartoons. The Ancient Celtic day of the dead that turns into Halloween, virtually all present Halloween traditions can be traced to the ancient Celtic day of the dead. Actually You can have Halloween without pumpkins! Jack Santino is a folklorist at Bowling Green State University. His books include The Hallowed Eve and Halloween and Other Festivals of Death and Life." Halloween is a quintessentially American holiday. Traditions focused on accumulation and consumption may seem very American, and certainly an American-style Halloween has evolved. But the origins of the holiday can be traced back to a pre-Christian Celtic festival called Samhain (pronounced “SAH-wen”). For the Celts, Nov. 1 marked the end of the harvest and the beginning of the new year. They believed that the souls of the dead mingled among the living at that time. And so they associated the fruits of the harvest with death, the afterlife and the supernatural.Later, after Saint Patrick and other missionaries converted Ireland to Christianity, Nov. 1 became All Saints’ Day, or All Hallows Day, and the eve of All Hallows became known as Halloween. It featured feasts, the blessing of the hearth, and the lighting of candles and bonfires to welcome wandering souls. It was and remains a family celebration in Ireland. Few early American settlers observed Halloween. It was Irish immigrants in the 19th century who were responsible for bringing many Halloween customs to the United States. The devil wasn’t part of the Samhain festival celebrated by the Celts — or the druids, who made up their priestly caste. They made sacrifices in honor of the dead, but those sacrifices more often took the form of burned crops rather than animals. Contrary to some accounts, there was no human sacrifice. It was only when the Catholic Church tried to supplant Samhain and other native holidays that the church branded practitioners of rival religions as devil-worshippers. Beliefs in the wandering dead persisted, but the supernatural beings honored by the Celts became associated with evil. And the Celtic underworld became associated with the Christian hell. The basic premise of the legend depicts an old Irish farmer, Jack, playing tricks on the devil and then all sorts of completely unrealistic conversations happened between Jack, the devil and God. This resulted in Jack being barred from both heaven and hell and wandering earth as a single flame housed inside carved vegetables. Folks believed that carving scary faces onto turnips would frighten away evil spirits. The tradition turned to pumpkins in America because pumpkins were more plentiful. The carved pumpkin, lit by a candle inside, is one of Halloween's most prominent symbols in America, and is commonly called a jack-o'-lantern. Originating in Europe, these lanterns were first carved from a turnip or rutabaga. Believing that the head was the most powerful part of the body containing the spirit and the knowledge, the Celts used the "head" of the vegetable to frighten off any superstitions. The name jack-o'-lantern can be traced back to the Irish legend of Stingy Jack, a greedy, gambling, hard-drinking old farmer. He tricked the devil into climbing a tree and trapped him by carving a cross into the tree trunk. In revenge, the devil placed a curse on Jack, condemning him to forever wander the earth at night with the only light he had: a candle inside of a hollowed turnip. The carving of pumpkins is associated with Halloween in North America, where pumpkins were readily available and much larger, making them easier to carve than turnips. Many families that celebrate Halloween carve a pumpkin into a frightening or comical face and place it on their home's doorstep after dark. In America the tradition of carving pumpkins is known to have preceded the Great Famine period of Irish immigration. The carved pumpkin was originally associated with harvest time in general in America and did not become specifically associated with Halloween until the mid-to-late 19th century. The imagery surrounding Halloween is largely an amalgamation of the Halloween season itself, nearly a century of work from American filmmakers and graphic artists, and a rather commercialized take on the dark and mysterious. Halloween imagery tends to involve death, magic, or mythical monsters. Traditional characters include ghosts, ghouls, witches, owls, crows, vultures, pumpkin-men, black cats, spiders, goblins, zombies, mummies, skeletons, and demons. Particularly in America, symbolism is inspired by classic horror films, which contain fictional figures like Frankenstein's monster and The Mummy. Elements of the autumn season, such as pumpkins and scarecrows, are also prevalent. Homes are often decorated with these types of symbols around Halloween. United States Consumerism reports mass-produced costumes date to as early as the 1930s and really took off to coincide with the rise of trick-or-treating. The major dangers are from falls and pedestrian/car crashes. Common-sense tips and reminders for motorists, parents, candy eaters, and costume makers. The stampede began when some children shouted "Ghosts are coming!" on the darkened staircase." At least seven children have died and 37 injured in a stampede at a primary school in south-western China. The incident occurred as the children were streaming down a staircase after Tuesday's evening classes in the Sichuan province, state media said. Five of the injured were taken to hospital in critical condition. Officials have launched an inquiry into the deaths in Tongjiang county, but have already ruled out any structural problems with the staircase. The rougarou (alternatively spelled as roux-ga-roux, rugaroo, or rugaru) is a legendary creature in Laurentian French communities linked to European notions of the werewolf. The Scottish Legend Of Mass Murderer Alexander "Sawney" Bean And His Cannibal Clan They would eventually have 8 sons and 6 daughters, all of which were raised to be part of this cannibalistic cult-like lifestyle. Eventually Bean wanted to expand the family even more and encouraged the children to breed with each other and build him an army. According to the Bean family ledger, found many years later, these incestuous acts brought Bean and Agnes a total of 18 grandsons and 14 granddaughters, now bringing the Bean clan to a total of 48 inbred, cannibalistic monsters. It was about 1430 A.D. when the Bean clan finally met their match. King James I of Scotland is said to have dispatched nearly 400 armed men, including himself, and bloodhounds to hunt down Alexander "Sawney" Bean and his insane family. A werewolf in folklore and mythology is a person who shapeshifts into a wolf, either purposely, by using magic, or after being placed under a spell. so tears run to a predestined end. Your suffering is over, Bela, my son. Now you will find peace. "I will find your earthbox and drive a stake through your heart!" COME HERE! Picture - Wolfbane is a blue flowering perennial of Europe that ancient Roman physician Dioscorides referred to as lycotonum. Highly toxic juice of the wolfbane plant, now known as monkshood, Aconitum napellus, could indeed kill wolves. Arrows tipped with it or baits laced with this plant would poison the predators that once prowled Europe. Naturally it was thought Acontium would destroy the curse of a wolfman as well. The English language herbals, are compendiums of accumulated plant lore and botanical cures invaluable when plants held the only medicines available. Originally written by hand, became far more common knowledge after 15th century. The two primary authors are Gerard and Culpepper, whose original herbals are still in print today. Oldest known copy of Galen’s “On the Mixtures and Powers of Simple Drugs.” Medicine’s Hidden Roots in an Ancient Manuscript. The first time Grigory Kessel held the ancient manuscript, its animal-hide pages more than 1,000 years old, it seemed oddly familiar. A Syriac scholar at Philipps University in Marburg, Germany, Dr. Kessel was sitting in the library of the manuscript’s owner, a wealthy collector of rare scientific material in Baltimore. At that moment, Dr. Kessel realized that just three weeks earlier, in a library at Harvard University, he had seen a single orphaned page that was too similar to these pages to be coincidence. “Simple Drugs” was a large work, an 11-book treatise. Sergius’s translations of Galen’s text were copied and recopied for centuries, and eventually became a bridge for moving the medical expertise of the ancient Greeks to Islamic societies. Real - Life werewolf looking people and their families. Lycanthropy has been recently proven to be a bonafide genetic anomaly which causes excess hair growth over the entire body. This gives the unfortunate person a furry animal-like appearance. Pedro Gonzalez, a 10-year-old boy was born on the Canary Island of Tenerife and had been given to Henry II 1547 as a gift by French corsairs. The boy's entire face -- his forehead, cheeks, nose and ears -- was covered in about four inches of dark-blonde fur, revealing only his eyes and lips. But until a century ago, those suffering lycanthropy or thought to be a werewolf were hunted down and killed. In Philadelphia on New Years Day we have the MUMMERS PARADE. "What's with All the Clowns Everywhere?" It quotes Folklorist Benjamin Redford, author of "Bad Clowns," University of New Mexico Press. Young people are scared, so this makes sense. Consider it an opportunity for story collecting and motif/meme education. Clowns are connected on a Jungian level with what other folk animae? Blackface minstrels (thug life), circus Indians (rampaging Injuns), bearded ladies (transexuals), hillbillies (working class rage), Siamese twins (Asians, the disabled), pinheads (Zika, the disabled), carnival barkers (the Media), magicians (jackleg preachers), thieves (banksters), tricksters and shapeshifters (politicians), strongmen, bully boys and bouncers (law and order, rogue cops) . . .